HALAL is an ace production company and photography agency based in Amsterdam and founded in 2010 as 100% Halal Productions by producers Gijs Kerbosch, Roel Oude Nijhuis and Gijs Determeijer. They work with a roster of severely talented filmmakers and visual artists. 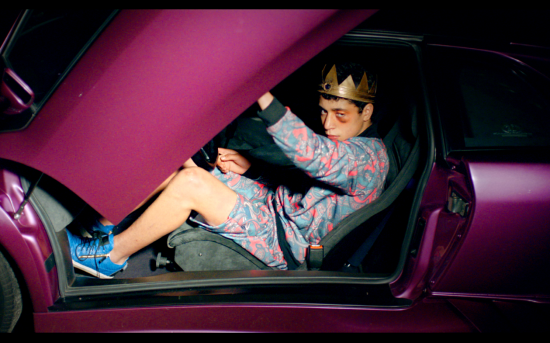 This week, their feature film, PRINCE, directed by Sam de Jong, hits theaters in the USA. In addition to their cinematic endeavors, they’ve produced commercials for Samsung & Dutch Heart Foundation and have fostered partnerships with such talents as Sophie Van der Perre, Juriaan Booij, From Form, Emma Westenberg & Nils Gerbens. Indiepix spoke with Halal producer and co-founder Gijs Kerbosh about their day to day creative activities, artistry in the Netherlands, scouting new visionaries, and what’s next. INDIEPIX: I visited IFF Rotterdam for the first time this year and saw quite a lot of great Dutch films. The impression that I got was that the media industry is more future oriented in the Netherlands in both style and content, in contrast to its European neighbors. Would you say that’s accurate and tied to the country’s history or is that a more subjective viewpoint as a visitor? HALAL: WHAT I NOTICE IN THE NETHERLANDS IS THAT THERE IS AN UPCOMING VERY TALENTED GROUP OF DIRECTORS, PRODUCERS, DP’S, PRODUCTION DESIGNERS AND EDITORS WHO ARE ALL CONNECTED WITH EACH OTHER AND WHO ARE NOW READY TO SHARE THEIR WORK WITH THE WORLD. THEY ARE FOCUSED BOTH NATIONALLY AND INTERNATIONALLY, ON THE NEW GENERATION WHO GREW UP WITH INTERNET, LONG FORM AND SHORT FORM CONTENT, AND NOT AFRAID TO DO BOTH AND LEARN FROM THAT. IP: What is 100% Halal’s role in the dynamic between your producers and your clients and what is the day to day process like? H: IN THE FIRST PLACE WE WERE LOOKING FOR THE JOBS THAT FIT THE DIRECTORS, AND NOT FOR JOBS THAT MADE THE MOST MONEY. IN THE LONG RUN, NOW, THIS MEANS WE GET TO PITCH ON THE REALLY INTERESTING JOBS WHICH ALSO HAVE GOOD BUDGETS. OUR PRODUCERS HAVE THE SAME TASTE AS WE DO IN GENERAL. OUR DAY TO DAY PROCESS LOOKS LIKE CRAZY AND CANNOT BE DESCRIBED. COME AND WALK A DAY WITH US. IP: How do you cultivate such a cohesive brand aesthetic across your various channels, and how would you describe Halal’s unifying ethos? H: BY FOLLOWING OUR TASTE, SEARCHING FOR THE RIGHT TALENT, AND PUTTING EVERYTHING ON THE LINE TO MAKE THEM AND US GROW DURING THE PROCESS OF MAKING. IP: How does the discovery process work for you? Do you scout individual artists? Where do you source your talent? H: WE DO ALL THE SCOUTING OURSELVES. OF COURSE OUR PRODUCERS AND NETWORK HELP A LOT. THE FIRST TWO THINGS WHERE WE LOOK AT IS THE WORK AND THE “PERSONAL CLICK”. IF THOSE TWO ARE THERE, WE WILL LOOK AT WHERE THE DIRECTOR IS IN HER OR HIS CAREER. AFTER THAT WE MAKE A PLAN TOGETHER TO LAUNCH THE DIRECTOR IN THE RIGHT WAY. IP:How do you see yourself interacting with the international filmmaking community? A few of your films already have , or are poised to enter the US market. Can you discuss your role in films like PRINCE and NECKTIE YOUTH? H: I THINK I AM A VERY PRO-ACTIVE PRODUCER AND WON’T LET THE BABY GO UNTIL SHE CAN WALK THE WHOLE WORLD ON HER OWN. I THINK IT’S NEEDED IN THIS TIME TO WORK VERY CLOSELY WITH THE SALES AGENT AND ALL THE DIFFERENT DISTRIBUTORS SO THAT ALL THE KNOWLEDGE ON DIFFERENT COUNTRIES AND FOCUS GROUPS IS SHARED. WE SEEM TO ALSO BUMP INTO THE RIGHT PEOPLE AT THE RIGHT TIME AT FESTIVALS ALL OVER THE WORLD, LIKE IT HAPPENED WITH THE GUYS FROM NECKTIE YOUTH. IP: What’s coming up next in 2015? This entry was posted on Wednesday, August 12th, 2015 at 8:11 pm	and is filed under Daily News, Film Business, Home Featured One, Interviews. You can follow any responses to this entry through the RSS 2.0 feed. Both comments and pings are currently closed.